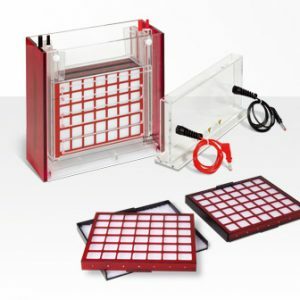 Electro-blotting is an important method to transfer proteins and nucleic acids from polyacrylamide gels to nitrocellulose or other carrier membranes. Semi-dry blotting allows fast, efficient and homogenous transfer. In contrast to tank blotting little transfer buffer is required and transfer times are dramatically reduced. Additionally, with semi-dry blotting discontinuous buffer systems can be used, e.g. one cathode buffer and two different anode buffers, to gently blot smaller proteins or to transfer proteins of very different sizes evenly. All Fastblot models offer the capacity to transfer multiple gels: stacked (with a dialysis membrane separating the gel sandwiches) or side by side. There is no requirement for additional plastic templates to prevent electrode short circuit as necessary for use with other brands of semi-dry blotters. The first graphite electrodes used for protein transfer corroded easily. Biometra permanently improved the blotting electrodes based on a novel bio-inert plasticised carbon material. This type of electrodes (used for models B33, B34) is stable for years. Alternatively, Biometra offers corrosionfree metal electrodes without pores for maintenance free use and easy decontamination. These electrodes (used for models B43 and B44) consist of a platinum-coated titanium anode and a stainless steel cathode. Both, the plasticised carbon electrodes and the metal electrodes can be used for higher currents (max. 5 mA/cm2 blot). Therefore blotting times are reduced to as little as 10 to 30 minutes. By applying higher current (> 1 mA/cm2 blot), proteins with higher molecular weights can be blotted faster and with higher efficiency. Even smaller proteins can be transferred faster from thick gels and gels with small pores when blotting with high current. Large proteins (> 100 kDa) require longer transfer times. The heat generated during the extended transfer time can be removed by using the flow-through cooling system which is available with models B33 and B43. Additionally this option is recommended for use with native gels and temperature sensitive proteins respectively. Nucleic acids can also be electro-blotted using the Fastblot systems. For transfer of DNA from polyacrylamide gels onto a membrane electro-blotting is the only way. 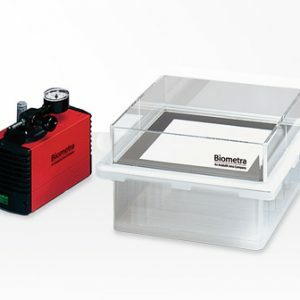 However, vacuum blotting is the method of choice for transferring nucleic acids from agarose gels onto membranes e. g. with the Biometra Vacu-Blot or capillary Blot Transfer Apparatus (please refer to pages 63 and 100). All Fastblots need a high capacity power supply. 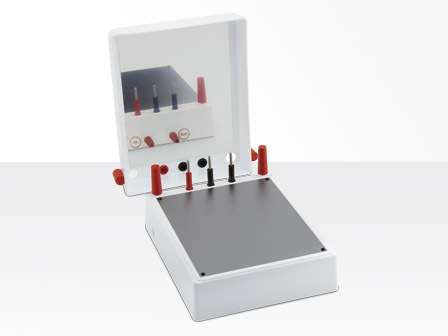 The ideal choice is the versatile Biometra Standard Power Pack P25, which can also be used for every type of standard electrophoresis application. * Note: This item is under discontinuation.